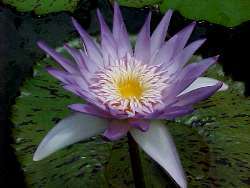 There are a number of ways to fertilize your waterlilies and other aquatic plants and a number of products that you can use. The important thing is that you do feed them! In the old days, well composted manure was mixed with heavy garden soil, the lilies planted and gardeners hoped the nutrients would last for the season. Today we have fertilizers designed especially for aquatics that greatly enhance plants' health and performance. Non-aquatic fertilizers can also be used with the results of some experienced growers below. Rate of application and frequency will be determined by your soil type, water temperature, plant size, pot size and which fertilizer you use. We give one Pondtabb per gallon of soil (sand in our case) in the pot to a normal sized waterlily every four weeks when the water temperature is 60-70F, every three weeks when the temp is 70-80F and every two weeks when the temp is above 80F. Small plants get proportionally less and large plants are fed weekly. Over the years we have done a number of side by side tests of fertilizers. When we first began growing waterlilies, the special aquatic tablets weren't available so we used Jobe's sticks (Beautiful Flowering Houseplants and Tomato formulations). These provided better results than no fertilizer but didn't dissolve very much. Weeks and months later they were still there, soft but there. We were happy to test Pondtabbs when they came available and Pondtabbs far outperformed Jobe's. Many growers, however, report excellent results with various Jobe's formulations. There are several very hard tablets labeled for aquatics that don't dissolve at all so really don't feed at all. The best alternative to Pondtabbs that we have found is Highland Rim but they are expensive in comparison even though they are double the size of Pondtabbs. We also felt they gave more foliage than flowers but others have reported the opposite. Please keep in mind that some of the big name fertilizer companies, hoping to capitalize on the boom in water gardening, have put new labels on existing fertilizers. They are designed for terrestrials, not aquatics. A few smaller companies have really devoted time to designing products just for aquatics and it shows in their performance. They are designed to begin breaking down in a matter of minutes, feeding almost immediately and are properly balanced for aquatics. We have tried time release fertilizers and they give a first fast feed and then don't feed at all. Granular fertilizers are out for us since we plant in sand and they tend to burn the plants. Fertilizers made to be applied to terrestrials as liquids, when applied to aquatics in "burritos", dissipate too quickly to provide the plants much food. With plants that can be difficult for us to grow we have had great success using a combination of Pondtabbs and the biostimulant cocktail we use on our Victorias. Details are here - Weakly Weekly. I use Gro-power (12-8-8) Tablets extensively for most plants, bog, lilies, and lotus. They dissolve pretty quickly, making them available to the plants almost immediately. They are easy to break, inexpensive, and very effective. I think that they were developed with the cooperation of the Santa Babara Botanical Gardens. While I must admit that I have always had a heavy hand with fertilizer, still, I always transplant my lilies into fertilized soil...even Victoria seedlings and small hybrid seedlings. I am convinced that most people do not give their lilies enough (or, frequent enough) fertilizer. Please note that I grow mostly TROPICAL water lilies, in a very hot climate and in sand/clay soil. Hardy lilies in a more temperate climate would not need the amounts of fertilizer I use. I feed twice a month. For estabilished plants, these same granular fertilizers can also be sprinkled on the soil in the pot, and then covered with more soil... I use a teaspoon full for six inch pots, and a tablespoon for ten inch pots; or, you can make several holes into the soil, and pour the granules down the holes, pinching them closed with more soil. Pondtabbs, Highland Rim tablets, Job's tree spikes (broken into pieces with a hammer) have all been good for supplemental feeding. I plant in pots with holes (so that the roots can escape and feed in the mulm), lined initially with a lily pad, then a thin layer of peat at the bottom, 14-14-14 time release fertilizer at a rate of 25g per gallon of soil and then good old Florida top soil, aka...sand. Most lilies are either repotted or supplemented with Pondtabbs after about three months.